» Friday Night Optimist Training (minors, pre-racing & start racing Levels)- Registrations Open! NYC > Junior Sailing > Junior Training > Friday Night Optimist Training (minors, pre-racing & start racing Levels)- Registrations Open! Please read the descriptions carefully to ensure you book in for the right level. Dates: The course runs for 8 weeks on Friday evenings from 17.00-19.30 to coincide with the Friday race training. The course starts on Friday 3rd May and ends on Friday 21st June. Levels: We are offering coaching for children at three distinct levels. Please read the descriptions below to ensure you’re booking your child in at the correct level. This course is for sailors who have completed the NYC Nippers/equivalent previously, but have not yet passed their Level 1/Start Sailing and are comfortable, willing and able to sail their own boat on their own & have access to their own boat. Note there is a minimum DOB – this course is open to sailors born in 2011 and older. This course is for sailors who have completed their Level 1/Start Sailing qualification, is able to sail a triangular course, has access to their own boat and does not yet have the confidence to take part in the Friday evening races (held inside the harbour). Note there is a minimum DOB – this course is open to sailors born in 2011 and older. This course is for sailors who have either completed their Level 2/Start Sailing qualification or participated in the Baltimore Regatta in February 2018 if not yet attained Level 2, is able to sail a triangular course, has access to their own boat and must be confident and capable of participating in the Friday evening races (held inside the harbour). The sailors will be competing in the Friday night races and have an instructor guiding them whilst participating in the Friday night races. These sailors will have to register for the Friday night races separately online here. 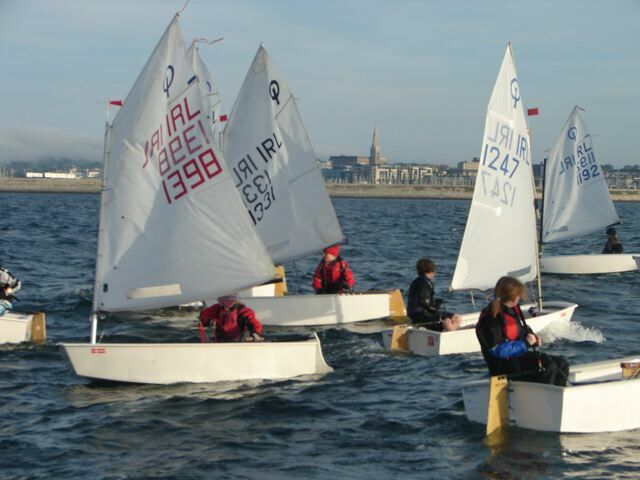 Note there is a minimum DOB – this course is open to sailors born in 2011 and older. Note that each child must have access to their own boat. Charter Optimists are available from the boat house if required at a cost of €100 for the eight weeks.